Hannah, also transliterated Chana, (Hebrew: חנה - Grace) was the mother of Samuel, the last of the judges, in the Hebrew Bible. She lived in the eleventh century B.C.E. as the pious wife of Elkanah; she endured the persecution of a second wife on account of her barrenness and conceived her son miraculously. In fulfillment of a vow to God, she offered the young Samuel to serve as a priest in the tabernacle at Shiloh, visiting him only once a year. Her sacrifice opened the way for Samuel to fulfill his destiny as the national leader who appointed the first two kings of Israel, Saul and David. The Bible records Hannah's hymn of praise in gratitude for the birth of her son. Known as the Song of Hannah, the hymn is discussed for its literary influence on a similar song attributed to Mary in the New Testament. It also has given rise to speculation that in an earlier tradition, Hannah's son may not have been Samuel, but Saul. Hannah is considered a prophetess in the rabbinical tradition, and her story has become part of Jewish New Year liturgy. The Hebrew name "Hannah" is the same as Anna in English. In the Biblical story, Hanna is one of two wives of Elkanah, son of Jeroham, who lived in the hill country belonging to his tribe of Ephraim. Elkanah's other wife, Peninnah, bore children to him, but Hannah remained childless. Nevertheless, Elkanah preferred Hannah. Every year Elkanah would offer a sacrifice at the Shiloh sanctuary and give Hannah twice as big a portion of it as he would to Penninah. 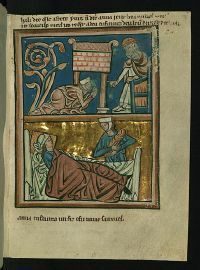 Hannah prays for a son while the tabernacle priest Eli listens, thinking her to be drunk. Hannah conceived and bore a son, and she called him Samuel. Envious of the love Elkanah showed to Hannah, Peninnah continually ridiculed and provoked her because of her childlessness. Peninnah's cruelty became particularly intense on those occasions when the family made the pilgrimage to Shiloh. This persecution was so intense that it caused Hannah to weep and refrain from eating. Eli, the High Priest, was sitting on a chair near the doorpost of the tabernacle and noticed the unusual passion of Hannah's prayer, in which she mouthed her words but did not utter them. Thinking her to be drunk, he reprimanded her. "Not so, my Lord," Hannah replied. "I am a woman who is deeply troubled. I have not been drinking wine or beer; I was pouring out my soul to the Lord... I have been praying here out of my great anguish and grief." (I Sam. 1:15-16). Realizing his error, Eli blessed her, saying "may the God of Israel grant you what you have asked of him." After Samuel was weaned, and with Elkanah's agreement, Hannah brought the child to Eli and Shiloh, where he began to serve as a priest at young age. Each year at pilgrimage time, she visited and brought him a new robe. Samuel eventually took the place of Eli's own sons as his spiritual son, since they were corrupt and unworthy of the priesthood. He went on to become not only the chief priest, but a great prophet, judge, military leader and kingmaker. More than any other figure in the period of judges, he unified the tribes of Israel. He also identified, anointed, and officially appointed the first two of the kings of Israel: Saul and David. 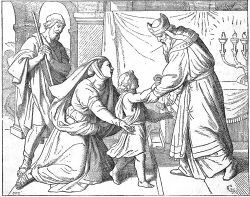 It is no exaggeration to say that in the biblical tradition, the kingdom of Israel was born from the faith of Hannah, the mother of Samuel. In rabbinical literature, Hannah is considered as a prophetess, and her Song as prophecy. This opinion is presented especially by Rabbi Jonathan ben Uzziel, the distinguished pupil of Hillel the Elder. This same Rabbi Jonathan taught that Hannah prophesied that her great-grandson, Heman (1 Chron. 6:33), together with his fourteen sons, would stand among the musicians in the Temple. Hannah is also praised by the rabbis for being the first person to refer to God as Elohim Sabaoth, or "God of hosts." The Talmud further affirms (Ber. 31a) that Hannah's silent but passionate prayer in the tabernacle ought to be taken as an example by everyone. Hannah's story is read on the Jewish New Year during the Rosh Hashana liturgy. Hannah brings Samuel to Eli: Was Saul her son in the original story? Modern commentators have suggested that in the original ancient narrative, Hannah's son may actually have been Saul rather than Samuel. The theory holds that Saul was replaced by Samuel in the story for reasons related to the royal pedigrees. Later editors loyal to the southern Davidic line were embarrassed by the story of the northern King Saul's miraculous birth, since no such stories were told of David. Two textual bases are given for this theory. The name "Saul" makes better sense with the rationale given for the name in the narrative. Hannah justifies the name because her son was "lent" by the Lord. "Saul" is related to the Hebrew word for "borrow" or "ask," while "Samuel" means roughly "he who hears El." Thus the rationale for the name makes little sense for Samuel, but prefect sense for Saul. The "Song of Hannah" implies that her son will be an anointed king. She begins her hymn by declaring "my horn is lifted up in the Lord" and concludes it by singing: "He will give strength to his king and exalt the horn of his anointed." Again, this makes perfect sense if Saul is Hannah's son. If she is singing prophetically in gratitude for the birth of Samuel, then it is for his deed of anointing the king, not being a king. Hannah's song is also discussed as having an impact on the New Testament tradition. 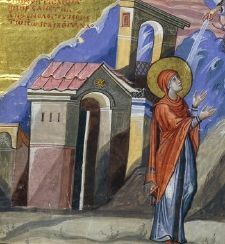 The Magnificat of Mary appears to parallel the Song of Hannah both in its opening praise of God for a miraculous conception and in its affirmation of God's concern for the poor. "He has brought down rulers from their thrones but has lifted up the humble," sings Mary. "He has filled the hungry with good things but has sent the rich away empty." (Luke 1:52-32) Hannah expresses virtually the same sentiments: "He raises the poor from the dust and lifts the needy from the ash heap; he seats them with princes and has them inherit a throne of honor." This page was last modified on 23 February 2019, at 17:46.